AUGUST BURNS RED have announced their early 2019 tour plans. The band will headline "The Dangerous Tour", presented by Sound Rink, alongside FIT FOR A KING, MISS MAY I, and CRYSTAL LAKE. The band also dropped the video for "Dangerous", featuring Big Foot. Watch it on KNAC.COM HERE. 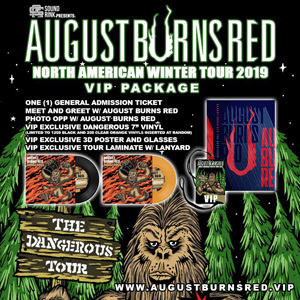 VIP packages for the tour feature a meet and greet and an exclusive, 7" record with the song "Dangerous" as well the midi version of "Dangerous" on the b-side, and an 18x24 3-D poster. "There are a lot of cities we missed on our first tour of Phantom Anthem and we wanted to make sure we hit those places on this album cycle," the band said. "It's been far too long since we've played most of these cities and we can't wait to return with our pals in FIT FOR A KING, MISS MAY I, and our new friends from Japan — CRYSTAL LAKE!"